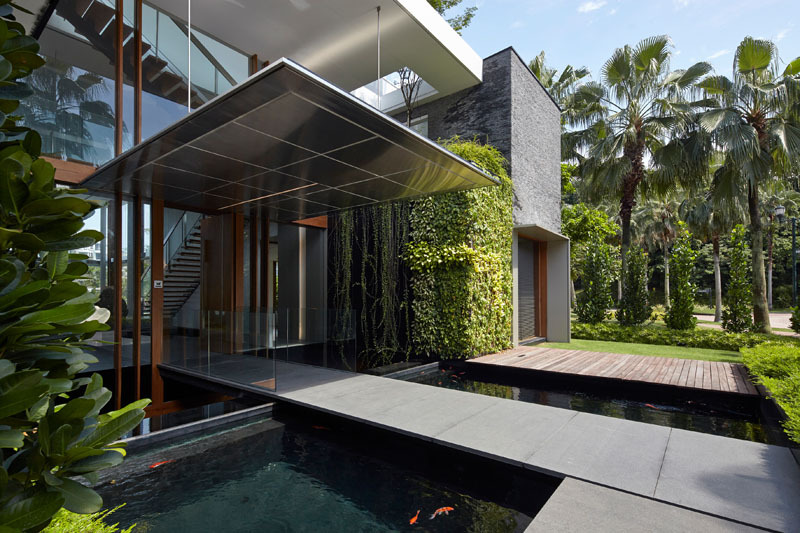 A modern home could have that resort feel surrounded with water features. 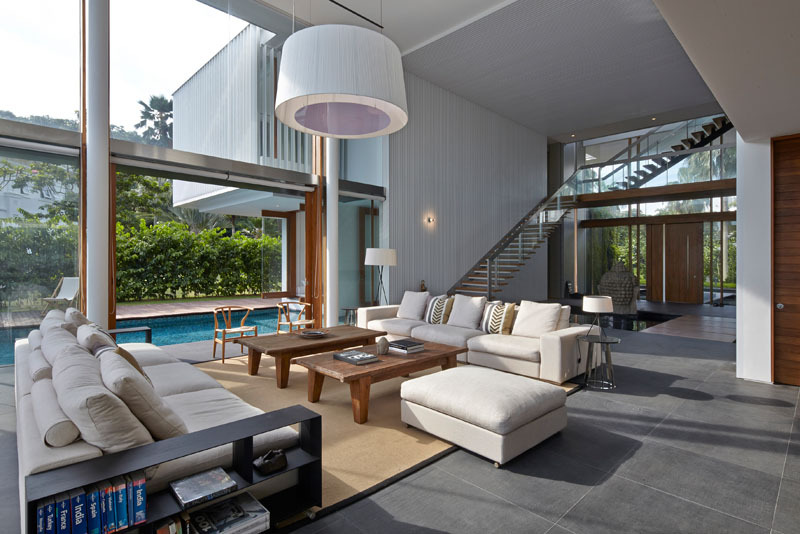 There is something about modern homes that make us love them. Despite the common features of lines and shapes in it, we can still notice how each one vary in design which proves how creative people really are. A home’s design cannot be exactly copied from another home because the size and even shape of a lot would vary. Aside from that, the needs of the owners also differ. A house design isn’t just about aesthetics but it is also about the needs and lifestyle of the homeowners. Today, we are going to show you another stunning home which can add to your list of inspirations. 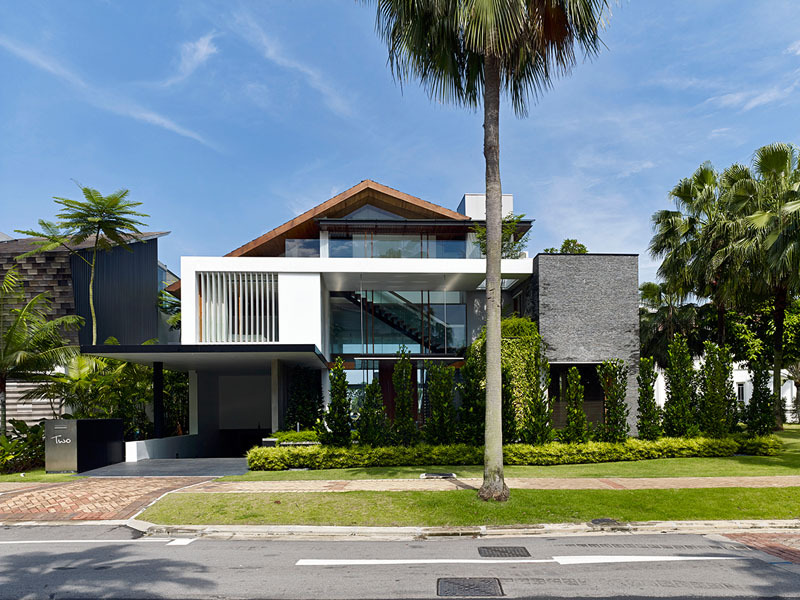 A house located within the residential area of Sentosa Cove in Singapore is designed to provide a resort-like home for a multi-generational family. The family commissioned Greg Shand Architects to design the house and with the way the house turned out, I can say that it was a right decision to work with the firm. The design of the house captures the natural elements and provides a resort-like yet homely retreat for the family. 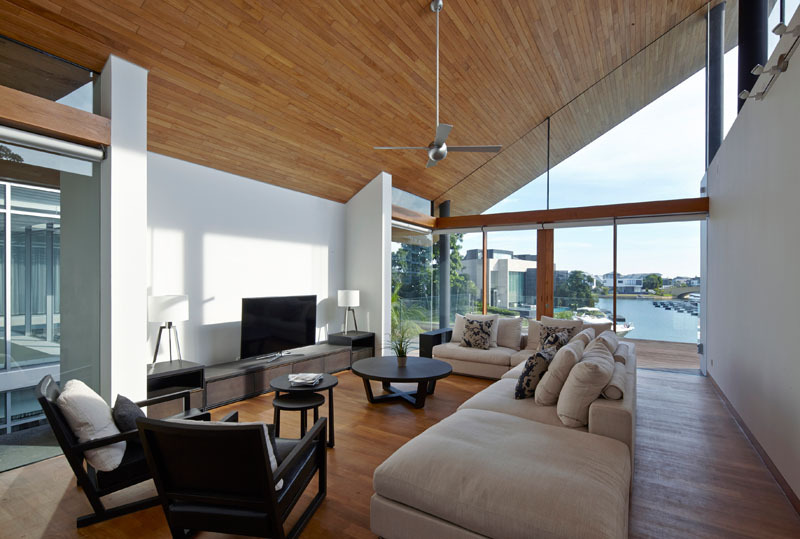 You can see a mix of materials in the house from wood, concrete as well as glass. Come join us in a brief tour of the house below. Unique feature: A resort like modern home with a beautiful pool area and water feature surrounding the house. Gorgeous. 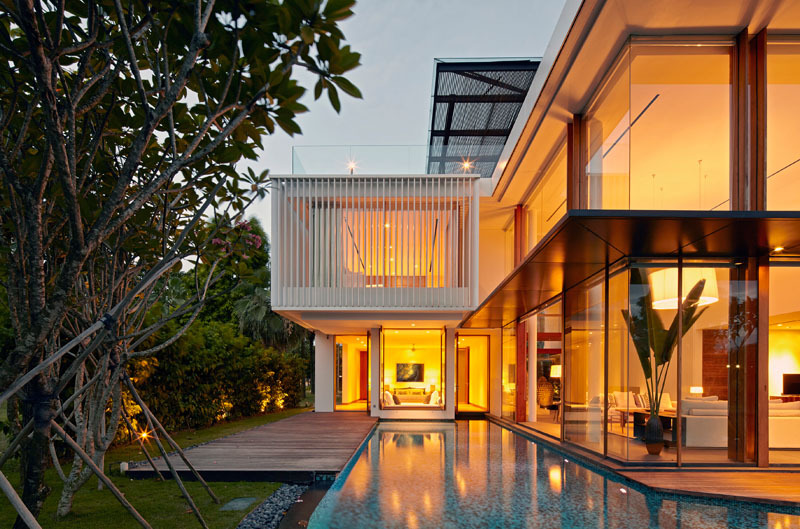 A modern house made use of geometric lines to complete its look using glass and other materials. It looks really nice with the lights in the interior. This is the facade of the house. It looks small here but it is actually spacious in actual. In this view of the house, you can already see the different materials used here. 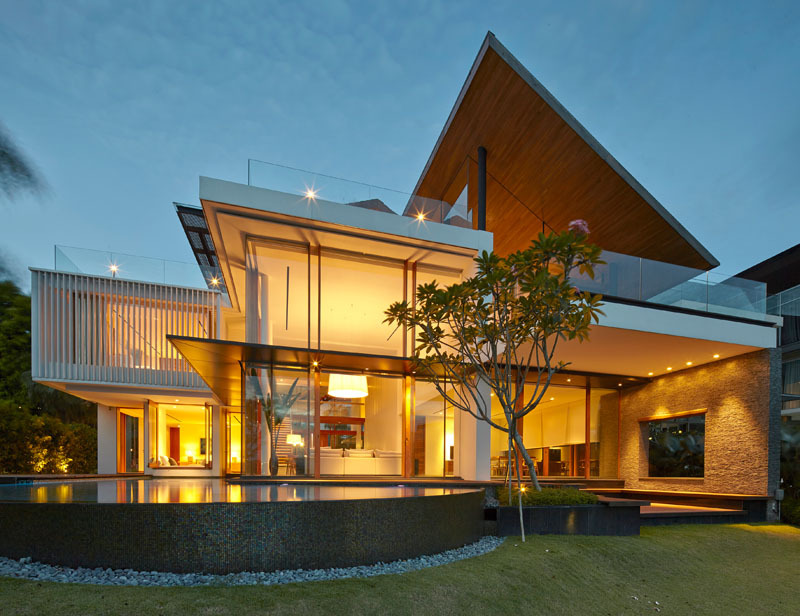 The landscape of the house is nicely done. Seen here is the curvy part of the pool area that has stones on its bottom part. The house on this area also has a pool and we can clearly see the mosaic flooring of the pool in this photo. Aside from that, we can see that the house has various volumes and spaces. 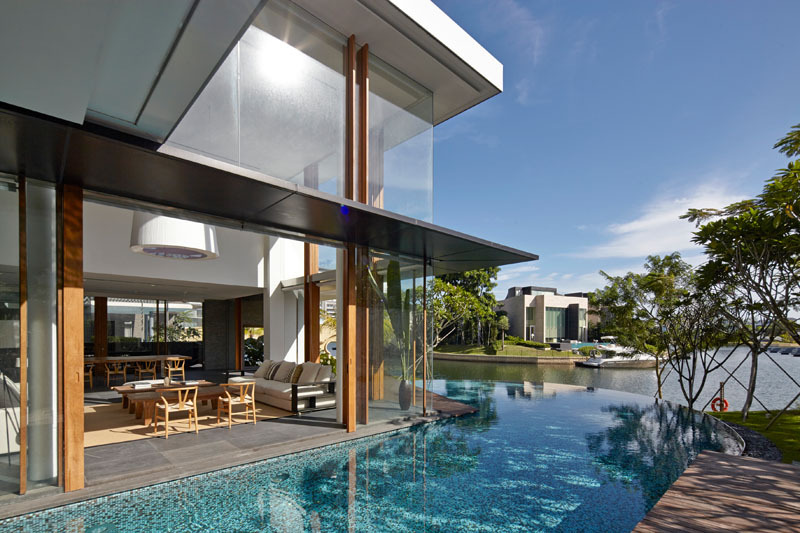 The house has a mix of glass and wood in its exterior which looks nice with the waters around it. The rear of the home faces a canal, and also has a private boat berth. Aside from the pool, it also has four ponds. The water found throughout the home isn’t just there to add appeal to it but also to promote air movement around the house and help to keep it cool. 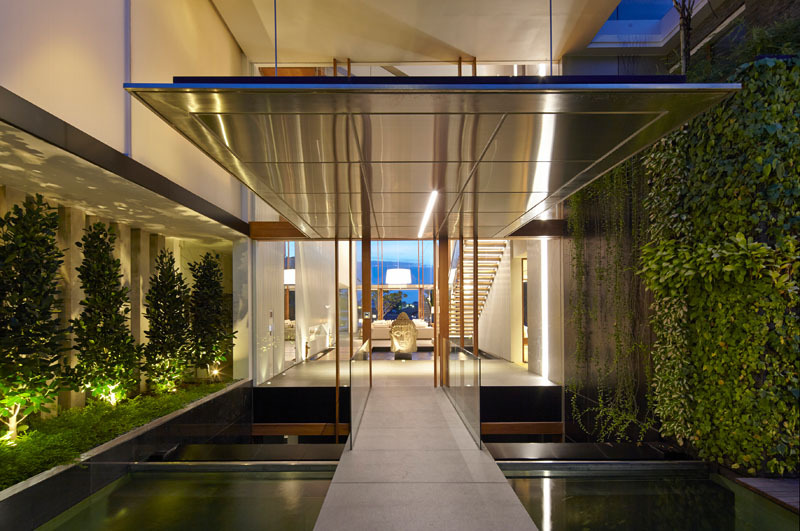 To enter the home, one would cross a bridge found above a koi-filled pond. On its side are bushes and grasses that made it looking even better. 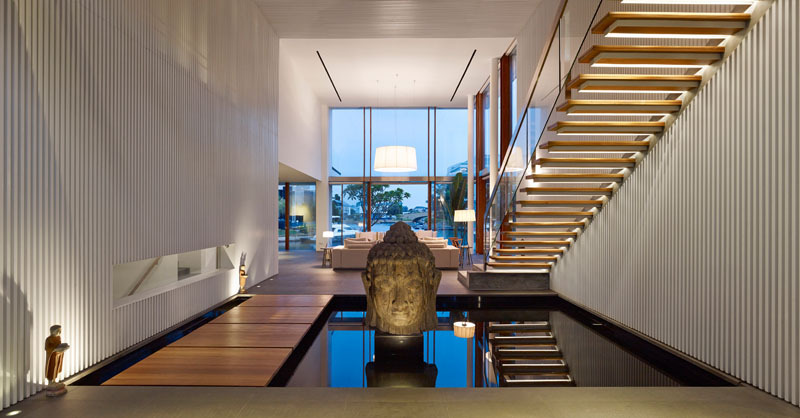 To get to the living room, one would walk through a floating teak walkway. 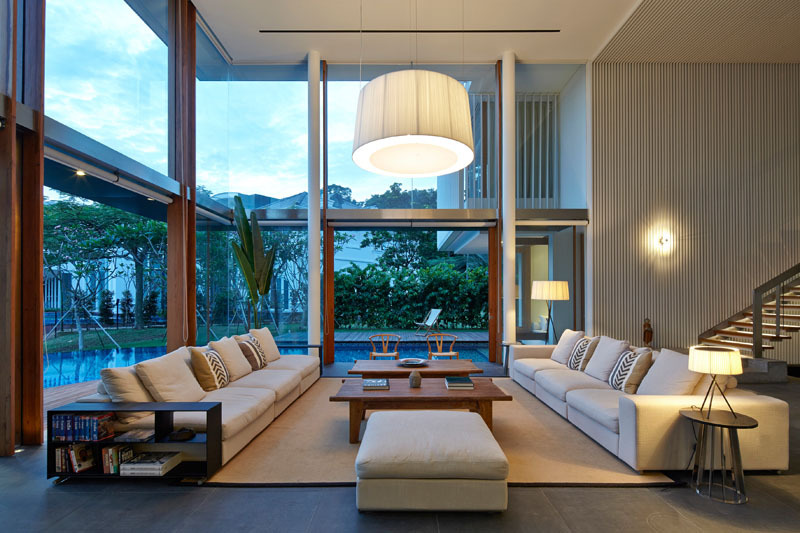 The double-height living room is the heart of the home with beige comfy furniture and a large round pendant light above a wooden table. 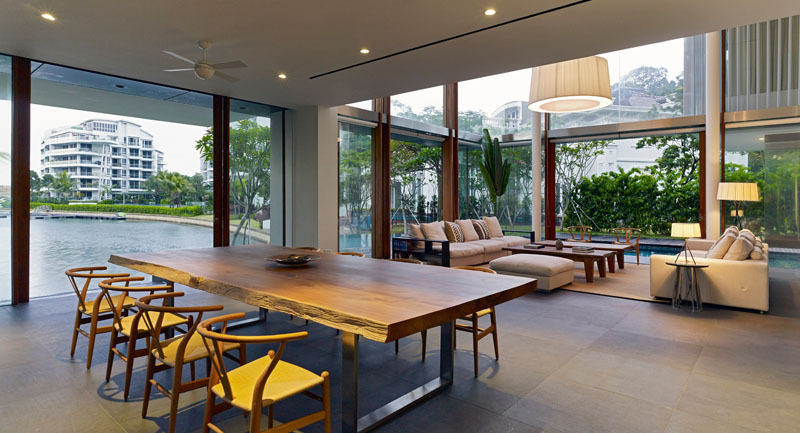 Large sliding glass doors promote cross ventilation, keeping everything cool. The living room shares the space with a dining room. The dining room is home to a large wooden dining table, perfect for large family dinners. Outside, there is a patio for enjoying the water views. 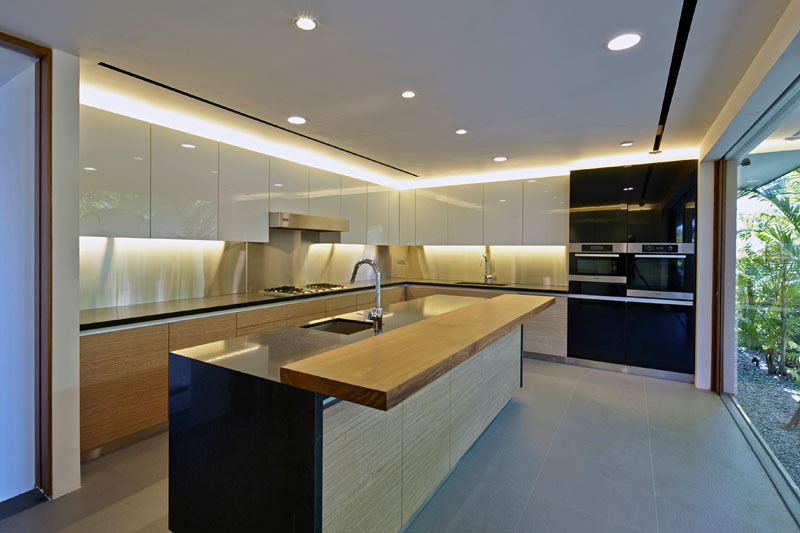 The kitchen has wood and high-gloss cabinets, as well as a large island with space for stools. Upstairs, there is a more informal family room for watching television and relaxing. 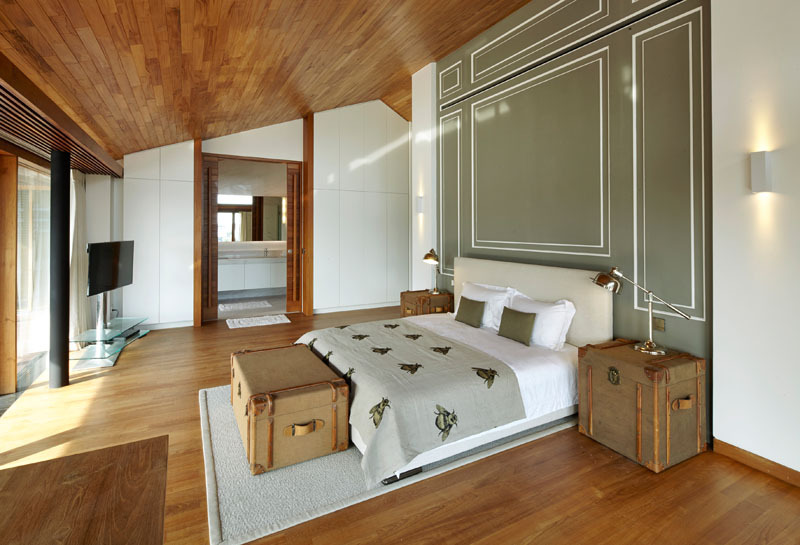 The home has many bedrooms, with this bedroom featuring a sloped wooden ceiling. The bedroom also opens up to a large balcony where the owners can enjoy a lovely view of the area outdoors. Beautiful, right? 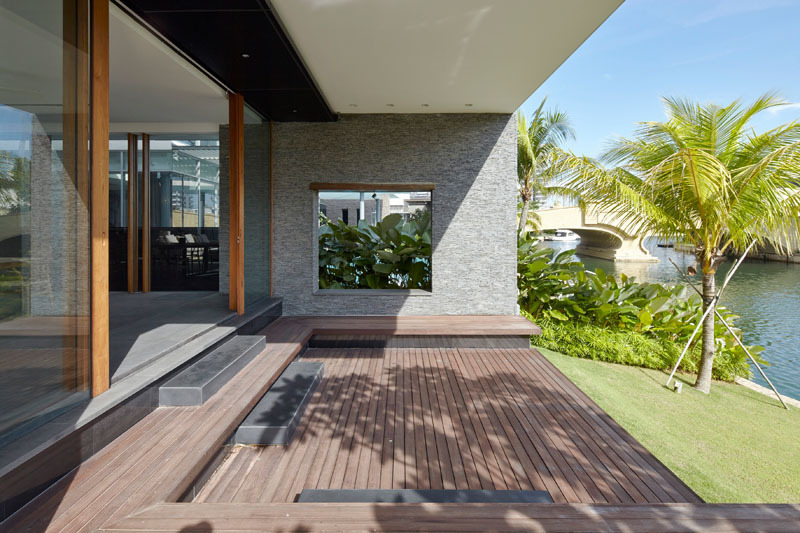 Aside from the exterior, what I love about this house is the interior that has comfy modern furniture as well as the outdoor area that has water features surrounding it. Even if it is not located in the beach or even if it isn’t an actual resort, the feel of the house is very relaxing and refreshing both inside and outside. 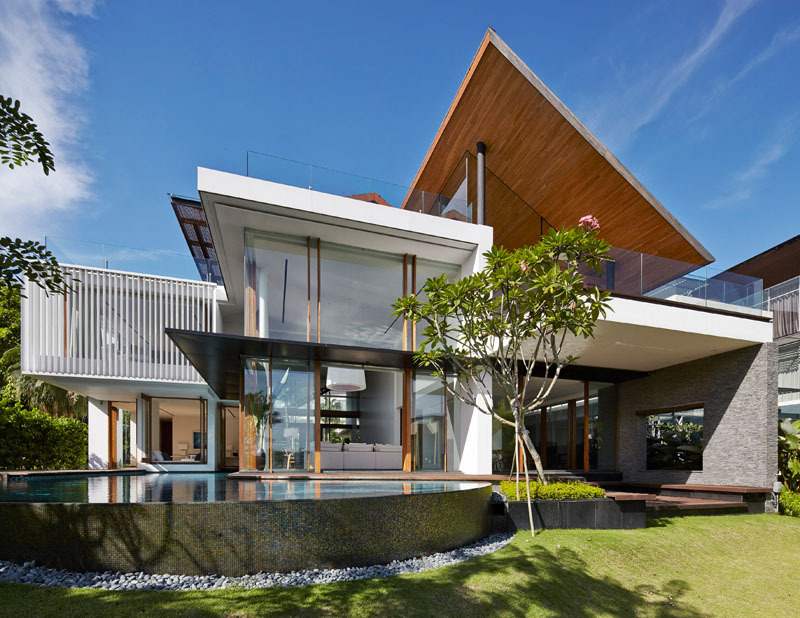 This house is designed by Greg Shand Architects and like the other homes that the firm designed, this one looks really beautiful too. How about you, can you tell me what you like most in this house?